Well Peter Prado is back, and better then ever! Just a quick post to update what happened, how it was fixed and how to avoid it again. So as you all know, we were pretty sure it was an blown alternator and we were right. 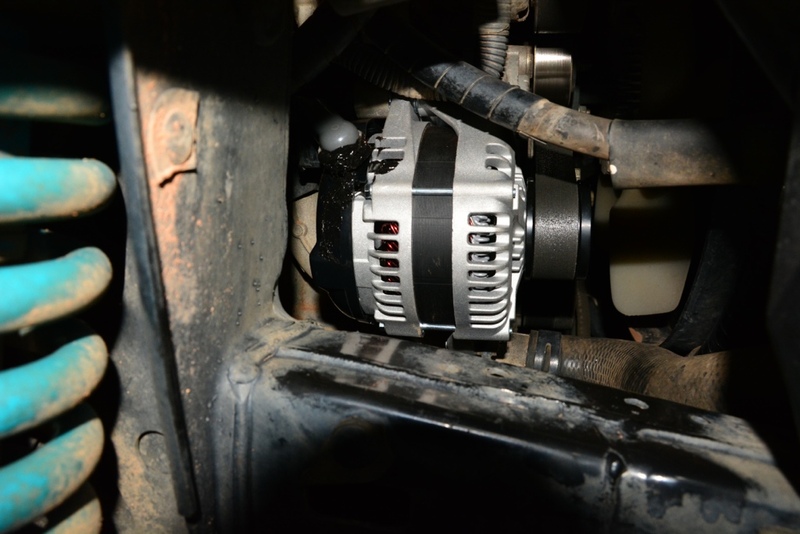 Peter now has a new and improved, bigger, better and much much shinier alternator. So, good to know that Peter is not that precious that a few dirt roads and a creek or two hasn’t killed him (Good boy Peter, he might have cut the aircon, and then the indicators, lights and eventually speedo and taco, but he got us all 150mtrs into Tennant Creek before finally giving in, like a valiant steed!) Also good to know that the second your spottie falls off, separate the wires and insulate them immediately. Thank you all for your encouraging comments, it was a pretty dark day the first day, but we have actually made the most of Tennant Creek and the forced stop, and believe it or not, Jess and I both said tonight how relaxing it has been…… Thanks Peter for forcing us to stop…. Next time though can we keep it under $1000 please! So after working out (thankfully quickly) that getting a brake controller installed was a must, it came time to work out what modifications to Peter would have to happen, and the ones we want to happen. Again I had planed to blog as these decisions happened, but I will have to do it retrospectively. I will break them down into separate posts though, so don’t worry, you are not going to noticeably age by the end of this post. Roof Racks, Awning, Rear Drawers System, Spotties, Snorkel, Steel Bull Bar, HF Radio. I think we were pretty realistic about the essentials, except some of you may say the new Stereo is a luxury, but I challenge anyone else to attempt this trip without a working stereo. Only the AM radio was working on the Stereo it came with, fine for Jess and I who have finally given in to the ABC and Radio National (and accepted our transcendence into our 30’s, not necessarily gracefully!) but 2 hour discussions on the emerging economics of China vs South America and how it will effect the taste of milk is not exactly engaging content for sub-7year olds. And yes mum, before you say it, I know you drove across the country in a non air conditioned Sandman ute with NO stereo, and a baby on your lap, but, well, “Kids these days are soft”……there, I said it…. So time to raid the piggy bank, who had already run off squealing for the hills after the purchase of Peter Prado. We had to coax him back with the lure of 0% Balance Transfer Credit Cards and a promise that we would not have takeaway ever, ever again. Well, Piggy came back…… We celebrated with some Pad Thai and Yellow Curry…….silly Piggy!